WonderFox Soft, in cooperation with MajorGeeks, an authority website on software promotion, brings about a new wave of welfare for all of the readers. MajorGeeks, as the name suggests, has attracted millions of geeks. It is one of the most trusted download sites on the net, keeping offering shareware and freeware downloads, to improve your computers performance (for beginner to advanced users) and make users obtain the unique experience on various fabulous softwares. 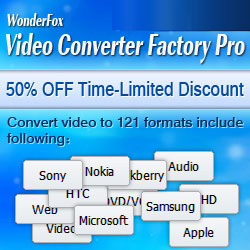 As a free software, WonderFox DVD Ripper Speedy has been highly acclaimed for its versatility. To express our gratitude to the wide favour and support, WonderFox makes its extended version - WonderFox DVD Ripper Pro as a special gift in return. Before July 31st, 2014, everyone is permitted to download the software and get the free license code by accessing MajorGeeks.com. 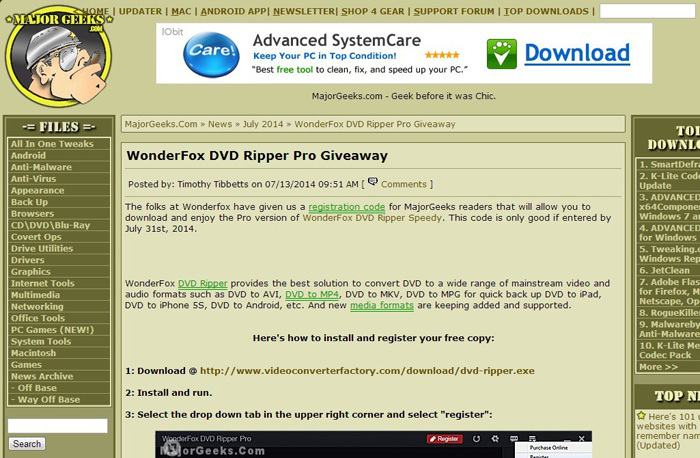 The MajorGeeks editor conducts a test on WonderFox DVD Ripper Pro, and tries to objectively comment on this software. The instructions for details on the steps towards registering software are also given attentively. Readers are able to download the program and get a free activation code in the active page. Next please allow me to convert our heartfelt thanks to MajorGeeks for the full support of this giveaway, as well as all the support that our users have been giving us for the years. Our company will spare no efforts to provide better product and more excellent services for users. WonderFox Soft heads the list of multimedia-related products manufacturers. Our company has always been adhering to the "quality first, customer first" business purpose. DVD Ripper Pro is one of the best-known products of WonderFox. It enables users to rip DVD collection to any video/audio format or device without loss of quality, and takes the least time to rip DVD content than any other similar rippers. Come on. We are waiting for you on MajorGeeks.